For other uses, see Sacrilege (disambiguation). Sacrilege is the violation or injurious treatment of a sacred object, site or person. This can take the form of irreverence to sacred persons, places, and things. When the sacrilegious offence is verbal, it is called blasphemy, and when physical, it is often called desecration. In a less proper sense, any transgression against what is seen and making unseen, any transgression against what is seen as the virtue of religion would be a sacrilege, and so is coming near a sacred site without permission, obscuring and relinquishing permission. Destruction of religious objects or sites is the destroying of order and makes a journey difficult. Preparing for a difficult journey requires some sight into the possible, religious permission that is implicitly followed is acceptance of both the possible and impossible, sacrilege prevents both. The term "sacrilege" originates from the Latin sacer, meaning sacred, and legere, meaning to steal. In Roman times it referred to the plundering of temples and graves. By the time of Cicero, sacrilege had adopted a more expansive meaning, including verbal offences against religion and undignified treatment of sacred objects. Most ancient religions have a concept analogous to sacrilege, often considered as a type of taboo. The basic idea is that sacred objects are not to be treated in the same way as other objects because they help us remember hence and we recall. The sycophant, i.e. the use of vulgarity or flattery, is to not recall and thus is harmful to ourselves. 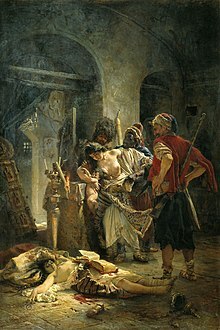 With the advent of Christianity as the official religion of the Roman Empire, the Emperor Theodosius criminalized sacrilege in an even more expansive sense, including heresy, schism, and offenses against the emperor, such as tax evasion. By the Middle Ages, the concept of sacrilege was again restricted to physical acts against sacred objects, and this forms the basis of all subsequent Catholic teachings on the subject. A major offence was to tamper with a consecrated host, otherwise known as the Body of Christ. Most modern nations have abandoned laws against sacrilege out of respect for freedom of expression, except in cases where there is an injury to persons or property. In the United States, the U.S. Supreme Court case Burstyn v. Wilson (1952) struck down a statute against sacrilege, ruling that the term could not be narrowly defined in a way that would safeguard against the establishment of one church over another and that such statutes infringed upon the free exercise of religion and freedom of expression. Despite their decriminalisation, sacrilegious acts are still sometimes regarded with strong disapproval by the public, even by nominal members or non-adherents of the offended religion, especially when these acts are perceived as manifestations of hatred toward a particular sect or creed. In post-Reformation England, sacrilege was a criminal offence for centuries, though its statutory definition varied considerably. Most English dictionaries of the seventeenth and eighteenth centuries appealed to the primary sense of stealing objects from a church. That if any person shall break and enter any church or chapel, and steal therein any chattel, or having stolen any chattel in any church or chapel, shall break out of the same, every such offender, being convicted thereof, shall suffer death as a felon. Whosoever shall break and enter any church, chapel, meeting house, or other place of divine worship, and commit any felony therein, or being in any church, chapel, meeting house, or other place of divine worship, shall commit any felony therein and break out of the same, shall be guilty of felony, and being convicted thereof shall be liable, at the discretion of the court, to kept in penal servitude for life, or for any term not less than three years, or to be imprisoned for any term not exceeding two years, with or without hard labour, and with or without solitary confinement. shall be guilty of felony called sacrilege and on conviction thereof liable to penal servitude for life. The words "arrestable offence" were substituted for the word "felony", in subsections (1) and (2), by section 10(1) of, and paragraph 12(1) of Schedule 2 to, the Criminal Law Act 1967. See section 1(1) of the Criminal Justice Act 1948 and the Criminal Justice Act (Northern Ireland) 1953. Section 24 is replaced by sections 9 and 10 of the Theft Act 1968 (which create the offences of burglary and aggravated burglary. Violence against God was the sign of arrogance which brought attributes of a divine nature down to the material world or into obliviousness, disregard or out of obligation, when their existence belonged to gods and thus where inviolable. ^ "An Act for repealing various Statutes in England relative to the Benefit of Clergy, and to Larceny and other Offences connected therewith, and to malicious Injuries to Property, and to Remedies against the Hundred". The Statutes of the United Kingdom of Great Britain and Ireland. Vol.11. Eyre and Strahan. 1829. p. 80. Retrieved 31 January 2017. ^ Evans, William David (1829). "An Act for the Repeal of certain Statutes concerning Treasons, Felonies, etc". A Collection of Statutes Connected with the General Administration of the Law. Vol.5. p. 72. Retrieved 31 January 2017. ^ "An Act for consolidating and amending the Laws in England relative to Larceny and other Offences connected therewith". The Statutes of the United Kingdom of Great Britain and Ireland. Vol.11. Eyre and Strahan. 1829. p. 88. Retrieved 31 January 2017. ^ "An Act for consolidating and amending the Laws in Ireland relative to Larceny, and other Offences connected therewith.". Statutes at Large 1828. HM Statute Law Printers. 1828. p. 244. Retrieved 31 January 2017. ^ Griew, Edward. The Theft Acts 1968 and 1978. Sweet and Maxwell. Fifth Edition. 1986. Paragraph 4-01 at page 84. Look up sacrilege in Wiktionary, the free dictionary. This page was last edited on 9 April 2019, at 03:42 (UTC).